As with most holidays in Greece, Greek Christmas also revolves around food! 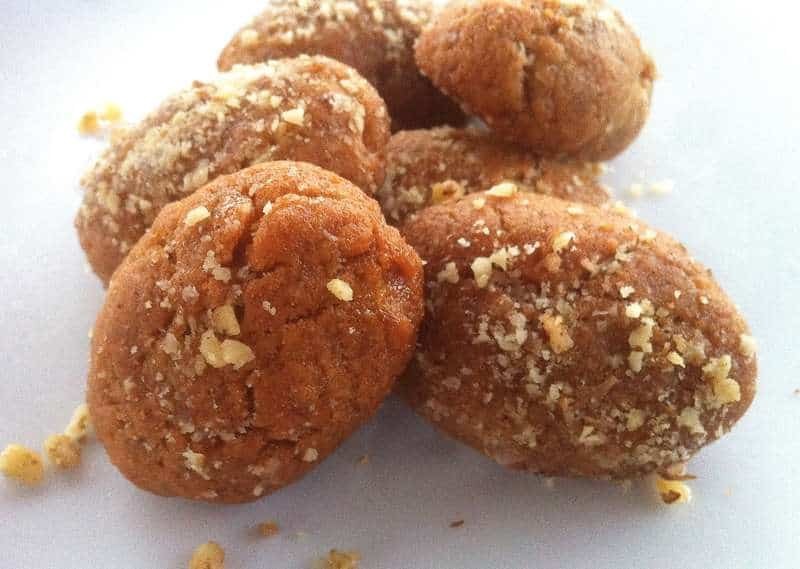 This means that these are these festive days of the year to make all these traditional Greek recipes, like kourabiedes, vasilopita, diples and of course these amazing sweet little honey cookies, the traditional Greek melomakarona! Melomakarona are my absolute favourite Greek Christmas treat. And how couldn’t they be! Greek melomakarona are incredibly soft, moist and flavorsome and soaked in a delicious honey syrup. For an authentic last touch sprinkle the melomakarona with chopped walnuts and just a pinch of cinnamon and clove. Once put in the oven, the intense aromas of the sweet spices permeates the house and brings back childhood memories. Just heaven! Try out this traditional sweet delight and let the smell of freshly baked cookies, orange and cinnamon remind you it’s Christmas! Enjoy! Oh and you can always read this delicious recipe in Greek here Συνταγή για τραγανά μελομακάρονα με σιμιγδάλι. To prepare this melomakarona recipe start by making the syrup first. In a pot add all the ingredients for the syrup, except the honey and bring to the boil. Boil for 3-4 minutes, until the sugar has dissolved and remove from the stove. Stir in the honey and set aside to cool completely. When the melomakarona come out of the oven, place them in the cold syrup, flipping them with a slotted spoon to absorb the syrup for approx. 10-20 seconds, depending on how syrupy you like them. (When syrupying the melomakarona it’s best do so in 2-3 batches). Remove the cookies using a slotted spoon, place on a platter and sprinkle with chopped walnuts. 2. Used a mixer by any chance or kneaded the dough for too long? If yes, gluten has developed and made the dough hard / almost bread like. 4. Possibly the cup was too small? It should be 250ml for a cup and if the dough feels a bit dry try adding a little extra oil mixture…. The dough needs more liquids. I use 1 and1/4 cups of orange juice and 1/2 cup of brandy in 3 pounds of flour. Yield 93 pieces. Hi Eli Katerina – If I made these in the next few days 8th Dec would them keep until christmas or am I better to make them closer to the time? Thats what I always do every year, make them about 2 weeks before Christmas and they are just fine for the whole holiday season. The problem is that they are never enough and they usually get eaten up pretty quickly! For the butter do you use salted or unsalted butter ? The description says “infused with fragrant butter”. I read the recipe three times and see no butter called for… Just want to make them correctly and can’t wait to try this out! I am having a hard time using the exact amount as is in the recipe because when I convert to cups it doesn’t give me the right amount…. Is there an easier way? This recipe is perfect, I used Kalymnian thyme honey and Iliada kalamata extra vergin olive oil… They were the best that ever came out of my oven. Instead of cognac I used grand marnier liqeur and I had fresh oranges, the ingredients really made the difference I think! I made these on Saturday for our Greek Orthodox Easter, I doubled the recipe and made 65 good sized biscuits. These biscuits caused a stir in my family, first my daughter ate 3 before we ate, my brother in law said that they were the BEST melomakarona he has ever had and his mother is a fabulous baker, I ended up breaking two up over really good vanilla ice cream and mixing it through which was heavenly to eat. I did change the recipe slightly, I used olive oil, I didn’t use vegetable oil as most traditional Greek recipes never call for vegetable oil and next time I will use less than the 250ml stated. But in saying that, I thank you for sharing a beautiful recipe that will now continue down the generations to come! I tried them and indeed very nice tasting. Dud not use olive oil because our variety in South Africa is not at all like the Greek ones in Greece and boy do I miss Greek honey! The best tasting honey around. Pity one cannot import Greek honey!